At harvest time, people used to make little figures or models from the last sheaf of corn in the harvest. These 'corn dolls' are still made at harvest time and are sometimes placed in churches during harvest festivals. You will need: about 8 fresh husks from ears of corn (or dried ones from a craft store), several cotton-wool balls, string, and a pair of scissors. To make the head and body, take a couple of corn husks and overlap them lengthwise. Place a row of cotton-wool balls in the hollow of the husks, bend the husks over and tie them firmly at the neck and waist. Then slide a rolled husk, with the ends tied for hands, through the body. Position the arms midway between the doll's neck and her waist. If the cotton stuffing spills out through the armholes, push it back inside the body. To make the skirt, place some husks around the figure's waist so that they cover her head and body, and tie them firmly in place at the waist. Now fold the top ends down to make a skirt and trim them straight across the bottom. 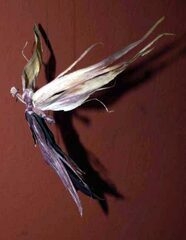 Stand your corn doll upright on her skirt and keep her through the winter until the following spring, when the new crops start to grow.